Mediterranean Diet for All » Diet Tips » What is common between the Food Dudes, Let’s move and the Mediterranean Diet? Really what is common between the Food Dudes programme in UK, the Let’s Move initiative in the USA and the healthiest and oldest way of living, the Mediterranean diet? One can clearly and quickly realize that all three have one common goal, a healthy diet which will enable all of us to live a healthy life. If we closely look into the ‘’Food Dudes’’, the ‘’Let’s Move’’ and the Mediterranean Diet we may infer that all three direct us to a healthy way of living through the daily consumption of fresh fruits and vegetables combined with physical exercise. Is this a surprise to the Mediterranean Diet followers? I dare to say, No. The Food Dudes programme is a healthy eating programme which is geared for children since the founders of the programme believe in prevention rather than cure and they want to prevent obesity and other related diseases. The programme which runs in all schools of the UK and Ireland uses modern and leading behavioural science methods so that it will enable the change to the dietary habits of the children and drive them to a healthier diet. The emphasis is on behavioural change and the programme has employed experts from many fields in order to develop techniques which will have the maximum and lasting results. The Food dudes are 4 characters, Raz, Tom, Charlie and Rocco, who take their names from the four fruits and vegetables they represent. Raz is named from Raspberries, Tom from Tomatoes, Charlie from Carrots and Rocco from Broccoli. Why fruits and vegetables? The UK government has recognized that a diet rich in vegetables and fruits has innumerable benefits and if starts early in the life of people and the consumption of fruits and vegetables becomes a habit, the benefits for the person and the community as innumerable. It has been verified that such a diet, rich in vegetables and fruits, helps in the prevention of obesity and diabetes, protects against many cancers and keeps skin and teeth healthy. This is what the Mediterranean Diet has been found to do as well! The Food Dudes state that fruits and vegetables are super foods and we the Mediterranean Diet people state that we have known this for centuries! 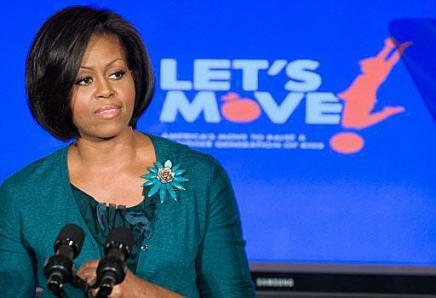 The Let’s Move initiative at the other end of the Atlantic Ocean, in an initiative by the first lady Michelle Obama and it is dedicated in solving obesity. The Let’s Move initiative targets in solving obesity among young children so that the children of today are grown up to be healthy individuals who will live a healthy live pursuing their dreams and hopefully help in the promotion of new healthy lifestyle. The initiative has five pillars starting with the children, empowering the parents, providing healthy foods to the schools, making healthy and fresh foods affordable and off course encouraging physical activity. The main target of the program is the fight against childhood obesity and this would be achieved with the introduction of fresh vegetables and fruits in the daily mean plan of every child. The My Plate food icon which is used as part of the initiative, aims to serve as quick reminder as to how the daily food consumption should be balanced. As we have written in our of our recent posts, What do you expect to find in a Mediterranean Diet grocery list?, eating healthy does not mean eating costly. With the proper planning you can stay on budget and be healthy and this is what the Let’s Move initiative teaches parents. The Let’s move motto is all about mobilizing society in order to raise a healthy next generation of kids. This would be achievement with the adoption of the initiative’s five pillars, one of which is physical exercise! Does this sound familiar? The Mediterranean diet is a diet which is complimented and completed with physical exercise on a daily mode. The ‘’Let’s move ‘’ initiative recognizes that physical activity is a healthy component of our lifestyles and encourages the kids and their parents to be active: Get active! Physical exercise in combination with healthy eating prevents chronic diseases such as stroke and cardiovascular diseases. The Mediterranean Diet is a way of living and a proven diet. It is a diet which is based on the frequent consumption of vegetables, fruits, legumes, whole grain products and others. The frequency of the consumption of the Mediterranean foods can be found by looking at the Mediterranean Diet pyramid. The Mediterranean foods can be cooked using the Mediterranean Diet recipes and using some basic ingredients like the olive oil which was found by many research studies to prevent cancer. Mediterranean Diet is complemented by physical exercise, preferably on a daily basis, and the two form the twin health factor for a healthy life. If we take a look at the two initiatives/programs, the Food Dudes and the Let’s Move, we will notice that both promote healthy food like fresh fruits and vegetables, using different techniques and approaches. However they are not as complete as the Mediterranean diet way of living is. This makes us wonder why the two programs did not adopt and promote the Mediterranean diet. It would have been a wiser decision to adopt a proven and complete lifestyle than try to promote part of it. However, whatever the case may be, the target of all is to have a healthy society and all acknowledge that prevention is better than cure. If you are aware of any other similar programs or initiatives running around the world please let us know so that we will analyse and reference them. We believe that our future wellbeing and well living is our hands and the sooner we adopt the Mediterranean diet as our way of living the better. We certainly encourage initiatives and programs which promote healthy living but we are sure that people would benefit more by adopting a proven diet the results of which are substantiated through extensive research and studies all over the world. Next post: Do you know these Mediterranean Diet Recipes and foods for a Healthy Lunch?